Google "embroidery alphabet letters" and you will find more inspiration that you could ever believe. I picked a fairly simple, but nicely curved letter and stitched it onto the napkin through tissue paper that I had drawn the letter on. It took awhile to pick out the tissue shreds afterwards, but it was worth it. 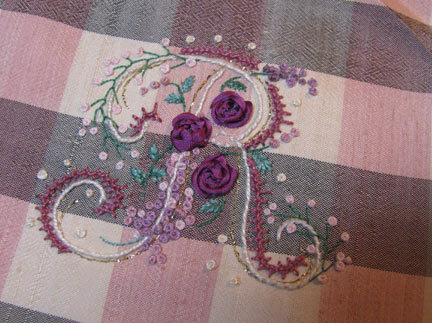 My napkin was very thin and delicate, so I lined it with plain muslin in the embroidery hoop, which you can't see. 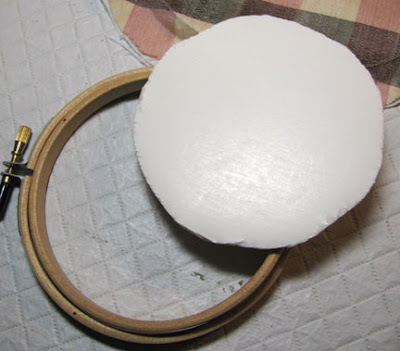 Once it's done, choose a smaller hoop for mounting. I traced around the inside opening and cut a piece of foam-core that size. 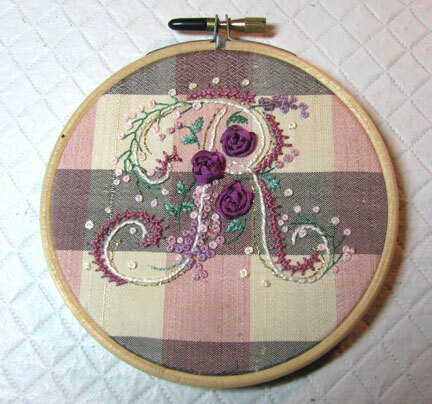 Place the embroidery into the hoop and center it properly. Pull it snug. Use double stick tape to attach another piece of napkin fabric (or other fabric) to the foam-core piece and wrap the edges to the back. Secure them with glue or double stick tape. 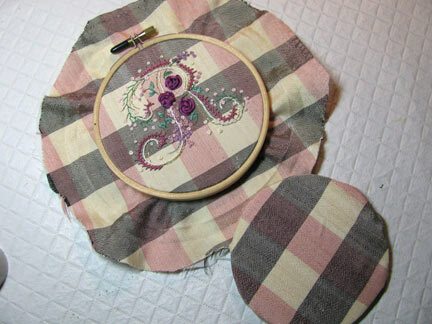 Flip over the embroidery and trim the lining fabric even with the inner hoop as shown. 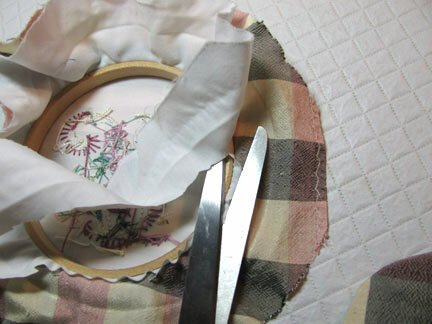 Wrap the extra napkin fabric into the hoop on the back and prepare to insert the foam-core piece. Adding filling is optional, but it does give a nice soft bow to the front. 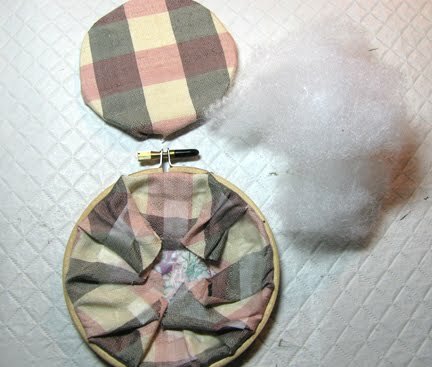 Since there are extra layers of fabric, I find that the foam-core fits snugly and does not need to be adhered in place. Like I said...I'm making more of these! I can see why you would make more of these! It's lovely!!!!! Thanks for the tutorial!!! Another bookmark for me!!! Do you know how many of your posts I bookmark! Guess I don't need to since I know where you blog is so I could just look up any technique and I'd find a 'how to' or a 'link to'! Thanks for all the shares! Thank you, Robbie...that is lovely of you to say! This is beautiful. And thanks for showing how to finish the back! Spring is coming...sooner than you think! Stones, stones, and more stones! Perfect leather cord bracelet for Spring!